Due to the dynamics in business environments and the large number of changes in job roles and tasks for employees, a time-consuming development of formal learning offers and the organisational-wide provision of vocational training are barriers for the wide adoption and use of learning technologies. Especially SMEs perceive current learning technologies as insufficient to support learning-on-the-job. Thus, the overall objective of MIRROR is to empower and engage employees to reflect on past work performances and personal learning experiences in order to learn in “real-time” and to creatively solve pressing problems immediately. MIRROR shall help employees to increase their level and breadth of experience significantly within short time by capturing experiences of others. A prerequisite for exploring innovative solutions in this context is to rely on human ability to efficiently and effectively learn directly from tacit knowledge – without the need for making it explicit. Conceptual model of holistic continuous learning by reflection which incorporates the essential ingredients of training critical thinking, awareness of emotions, (collaborative) knowledge construction, creative problem solving and innovation. Within a so-called “AppSphere” a bundle of real-time, interoperable learning applications that can be used within the collaborative and social work environment of the employees. Prove of learning effectiveness through evaluation within five testbeds. 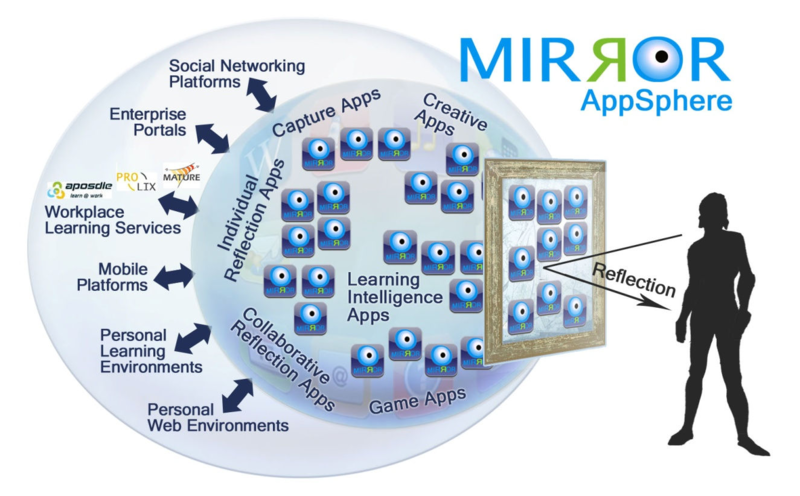 MIRROR will be the first technology-enhanced learning approach that can be used in highly dynamic working situations where no teachers, no formal content, and no explicit knowledge are available. Existing research results from projects such as APOSDLE, MATURE, PROLIX will be made enriched by combining them with MIRROR applications. The MIRROR consortium brings together 15 partners of Europe’s TEL industry, high-quality research and testbeds. Sorry, but the selected Zotpress nickname can't be found.